I cut 8 pumpkins out from the garland and punched a hole in the stem. I applied my glitter to both sides. Put the bakers twine through the hole in the stem and make a bow. After I hung the pumpkins I was thinking the tree could use a couple more pumpkins. Oh well I still have plenty of time to do some more later! LOVE sparkles and tress and halloween! So many favorites! Enjoyed this post! I been working on Halloween since July and I'm so glad because I might actually get to enjoy my projects this year. If you get a chance come link up your tree at my Fall Edition Pin Party. That's so adorable! I love it! Spooky and fun! Such a cute idea! 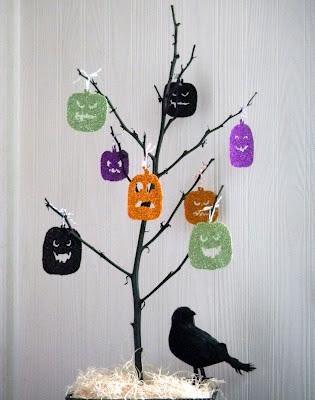 I might do something similar, but get my boys to decorate some pumpkin cut outs for the tree. I'm linking up through Pinapotamus. Love all your crafty stuff! It is definitely not too early to be thinking about Halloween! I love your tree!!! Great job. I'm also your newest follower. I hope you will stop by when you get a chance! I am a new follower from Under 300 Followers Blog HOP! I loveeee halloween decorations! These ideas are great. We have a little tree thing (my fiance would know the real name...) that bloomed that is real creepy like now. I want to try this! So creative...I love the sparkly touch! Saying Hi from Mom on A Time Out Hop...I host Photo Friday Link Party, I'd love to have you link up this or any other original photo from your blog. Happy Hopping! Thank you much for linking up at JAQS Studio's Linky Party :). I've featured your project today :)! Your tree is Adorable!! 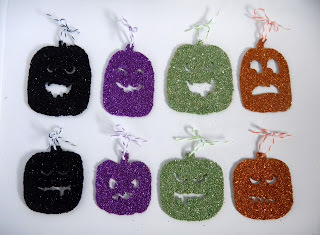 Love the glitter pumpkins! Thanks so much for sharing at Thursday's Temptation. I am featuring your tree at the link party!